Practical nursing is one of the fastest growing professions in Virginia, making it a wise choice for those looking to enter the healthcare field and help others in need. The US Department of Health and Human Services predicts that the state will actually experience a surplus of LPNs by 2025, but that doesn’t mean there won’t be opportunities for aspiring LPNs in this state. The right education and training can lead to a promising career as a licensed practical nurse in Virginia. For a leg up on the competition, read on to explore accredited LPN programs that can help you prepare for the NCLEX-PN and learn how to successfully obtain a valid license. Interested in an LPN career? The first step is to enroll in a state-approved practical nursing education program. Whether a diploma, certificate, or associate degree, Virginia community colleges and technical schools offer the necessary training for those interested in a career as a licensed practical nurse. Use the search tool below to browse through options and compare top choices. Each state has its own licensing requirements for LPNs. To become an LPN in Virginia, one must meet the requirements outlined below. Have completed at least two years of high school. Those who graduated from LPN programs in Virginia must use the Licensure by Examination method. This requires the student to have graduated from a program approved and within the confines of the state of Virginia. 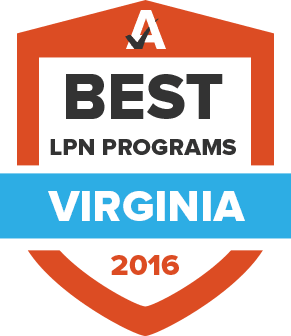 After completing the LPN program, students must apply to the Virginia Board of Nursing and sign up to take the NCLEX-PN. For those who attended an approved LPN program from a state other than Virginia and have become licensed in another state, they must utilize the Licensure by Endorsement method. LPN applicants must have a license in good standing as well as pass a criminal background check. Either method requires applications to be submitted online only. Keep in mind that Virginia is a Nurse Licensure Compact State. This means that a graduate of an LPN program who becomes licensed in Virginia can also work in any state that is also part of the compact agreement: This currently pertains to 25 states. This multi-state license can be obtained through Virginia if the applicant’s primary residence – where they live and file taxes – is in Virginia. 30 contact hours of workshops, seminars, conferences, or courses related to nursing. The national median wage for LPNs is notably above the national average for all other occupations; the median wage for LPNs in Virginia is no different. The following chart shows what LPNs can expect to make in Virginia compared to the rest of the United States. The official government website that covers all aspects of the licensed nursing profession within the state of Virginia. The Virginia League for Nursing advocates the interests of the National League for Nursing for the state of Virginia. This professional organization promotes the interests of Virginia LPNs. The VNSA seeks to advance the profession of nursing by helping nursing students through scholarships, mentorships and community service. Comprised of over 1,400 nurses who work in Emergency Nursing, this organization works to assist nurses of all licensure levels who work in emergency areas.